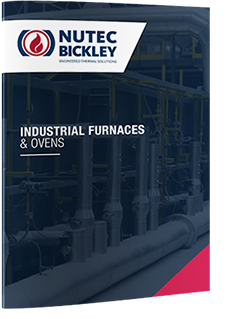 Nutec Bickley provides tip-up furnaces and ovens in custom designs and sizes to match customer production and process requirements. Tip up Furnaces eliminate possible door leakage by allowing the entire furnace bottom perimeter to seal against a fiber / sand seal box. Austenitizing and tempering of forged parts. Austenitizing and tempering of steel castings. Normalizing of steel forged parts and castings. Heat Treatment of Malleable Iron Castings. Austenitizing and tempering of tubes and round bars. Annealing of steel wire and other products. Design to comply with AMS 2750E, with temperature tolerance capacity up to class 1 if necessary. Flexible designs in one unit to comply with Temperature uniformity surveys (TUS) from 950 F to 2100 F.